Hump day, we meet again. Hope everyone’s Labor Day was as unlaborious as mine was. Friday night the beau arrived back into town from a week away and surprised me with a reservation at my FAVORITE spot. 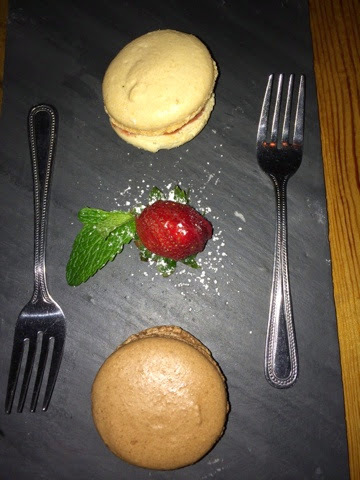 Delicious dinner and macarons for dessert ensued. I guess I made such a fuss over the new citrus flavor that beau asked if we should have another round of them. Of course we “should” have, but we did not. We debated traveling to any of number of places for a quick getaway, yet remained at home with the comforts of a new gym and pool. Usually one to take a three day weekend as an excuse to make a quick international jaunt, I was rather confused. The next three days were a blur of furniture shopping, house hunting, and escaping the heat (and half put together apartment) dips in the pool. It was a scorcher, and ended up being a nice little staycation which actually has never happened prior or at least in a very long time. I’m simultaneously relaxed and energised…the trip planning wheels are in motion. Activate vacation planning mode!